The Carlsbad Flower Fields are a must-see attraction in San Diego between the beginning of March to Mother’s Day. It’s also one of the most Instagram-worthy and picturesque places in SoCal! Yes, this is pretty much how my brain works after blogging and content creating for almost two years. The fields are a beautiful and fun place to spend Mother’s day. My mom loved it when I took her last year. She especially loved the botanic section since succulents are her biggest hobby, and we also had fun making mixed bouquets. Last Mother’s Day, the cost was only $5, which isn’t bad when compared to flower shop bouquet prices. Another fun activity you can do at the Flower Fields on Mother’s Day is watching the Mariachi performances. Just ask for the performance times when you first enter the fields so you don’t miss them! I’ve also heard that the management has changed its flower color pattern for the first time in over 15 years. The new array of colors consists of yellow, pink, red, orange and white. Designed by a professional colorist, the 50 acres of Giant Tecolote Ranunculus flowers that are spread out down the hillside in a spectacular rainbow pattern – and they’re just stunning! Other flowers include petunias, roses, poinsettias, sweet pea blossoms, and orchids.The fields also overlook the Pacific Ocean so don’t forget to look behind you and admire the water! 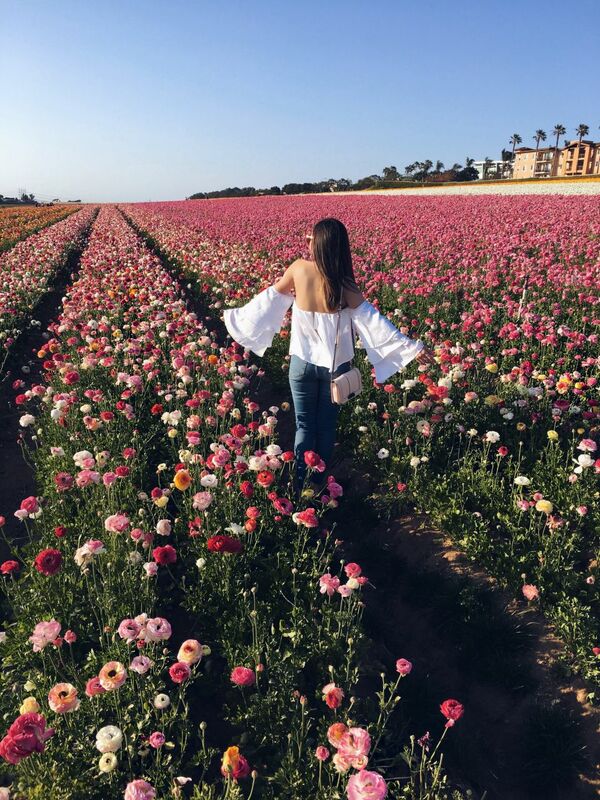 Wow-za facts: More than 160,000 people visit the fields each year, and The Carlsbad Flower Fields are the only ranunculus grower in the world that allows visitors to walk the grounds to experience the flowers up-close. They also have other fun activities like a sweet-pea maze (definitely recommend checking this out! ), a historical display on the evolution of the poinsettia, a cymbidium orchid greenhouse, rose and other themed gardens, an open-air wagon that’s pulled by an antique tractor for those that don’t want to walk (for an extra fee), a mining area, and a water-wise garden area. Blogger tip: The Carlsbad Flower Fields are also used as a wedding and reception venue year around, but I recommend planning your wedding for the Spring when the flowers are in full bloom (which is mid-April to the closing day). Picturesque backdrops: The Pacific Ocean, the rustic barn, the gazebo and the sunflower-lined walkway between the flower beds.